International flights direct to Aswan, or via many European and Eastern European cities. Also package tours and charter flights. Contact us for details. The Nubia Museum harbors the history of the "Land of Gold" as the word Nubia in the Hieroglyphic, language of ancient Egypt in which pictorial symbols are used to represent meaning and sounds, means the "Land of Gold"...Hence, this land, over times, was abounding in monumental treasures. The Nubia Museum, in Aswan, as a matter of fact, is deemed to be one of the most important Egyptian museums. A number of factors have combined together, yielding the magnificence of such museum, as it is the only unique open museum of its kind. Preparing this museum lasted for ten years, all dedicated for hard work to come up with such lovely museum. Let alone, it stands as a wonderful model of international cultural cooperation representing in United Nations Educational, Scientific, and Cultural Organization (UNESCO). In April 6 th, 1959, the Egyptian government appealed to the United Nations Educational, Cultural, and Scientific Organization (UNESCO), seeking help to salvage the monumental sites in Nubia, hence, the area between Aswan and the Sudan was inundated by the Nile waters especially after completing the Aswan Dam. The response of the (UNESCO), in fact, came fast, as it called upon the international community to contribute to this project. Since then, (UNESCO) has been a key player in the archaeological field in Egypt. In no time, the executive committee, comprising representative of 15 member states, was set up, and was commissioned with studying technical, monumental and financial reports with the aim of providing the (UNESCO) with basic information required to effectively implement the project. The (UNESCO), obviously, has contributed much to nudging the entire world to pay more attention to saving such invaluable monuments. By the end of 1975, and as a result of this relentless support on the part of the (UNESCO), the donations influx - contributed by 24 countries - amounted to $ 123304. Unsurprisingly then that the operation of saving the Nubian monuments was described as the greatest in the history of saving monuments. overlooking the genuine spots, drawn by the ancient Egyptians 3000 years ago. The world outcry, however, was translated into many concrete actions; donations to salvage the deteriorated-condition monuments, a number of excavation missions - which pursued their tasks in such hard conditions in areas extend 500 kilometres along the Nile banks. A number of 40 missions have taken part in this great but difficult job, unearthing several priceless treasures dating back to pre-history times; Pharaonic, Greek, Roman, Islamic and Coptic. Fossils, which were discovered during excavations, undoubtedly provided full knowledge about Nubian life and its development along ages. In January, 1975, the General Egyptian Authority for Antiquities submitted a request to the (UNESCO) seeking the organisation's assistance to preserve the ancient Egyptian monuments, through establishing a city for museums harbouring a cluster of open museums with a view to displaying rare and wonderful monuments of various ages. Since February, 1981, a number of symposiums and seminars was held for contribution to this great project. It was the first time in the history of the (USECO) to decide launching an international campaign to establish local museum. This, however, could be ascribed to the magnificent monumental treasures Egypt has. On February 4 th, 1986, the foundation stone of the museum of Nubia was laid down, playing new effective role that was derived from the spring of culture and civilization at both home and international levels. To the Egyptians, the museum is to display life over centuries. As for foreign visitors, the museum will show the history of such unique area, as a source of knowledge for researchers from around the globe. The International Museum of Nubia is located in Aswan on an area of 50,000 square meters, 7000 of which are excluded to building, while the rest designed to be the yard of the museum. The building has three floors for displaying and housing, in addition to a library and information center. The largest part of the museum is occupied by the monumental pieces, reflecting phases of the development of the Nubian culture and civilization. Three thousands pieces of antiq., representing various ages; Geological, Pharaonic, Roman, Coptic and Islamic, were registered. The open-door exhibition includes 90 rare monumental pieces, while the internal halls contain 50 invaluable pieces dating back to the pre-history times, 503 pieces belong to Pharaonic time, 52 of Coptic era, 103 of Islamic age, 140 of Nubian time, in addition to 360 pieces having the tang of Aswan. The work in this unique edifice lasted for 11 years straight, and cost LE 60 million. The museum of Nubia gained this unique position simply because it harbors unique monuments not in any elsewhere. It houses the statute of Ramsis II, which was laid at the very forefront of the Museum, statute of Amenras the spiritual wife of Amen, she is of Nubian origin. It, also, has the head of the Shpatka, of the Nubian origin, made of rosy granite, head of black granite of Tahraqa, the Nubian King, whose reign during the 7th century BC was said to be full of prosperity. There is a temple of his name with gold-plated pillars. There are, also, four mummies for nobles, which were found in Kashmatkh town in Nubia. The museum, as well, houses several models and styles of the Nubian heritage, the panorama of the Nile, depicting live image of the River Nile streaming through its banks. There is also a model for the Nubian-style house, typically copied to mirror the nature of life in Nubia. All pieces exhibited in the museum reflect the character of the Nubia over history and display how it merged with the Islamic civilization on one hand and the mother civilization of Egypt on the other. So, the museum of Nubia plays vital role not only at the level of promoting Nubia to the entire world but also at the level of maintaining monuments and supporting researchers, interested in Nubia, from around the globe. This, however could be achieved through the museum's study center and the documentation centers which publish more information on the "Land of Gold" in Egypt, the past, the present and the future. Nubia Museum, which hosts 3000 monumental pieces of several times, ranks tenth in the list of the museums inaugurated in Egypt over the past three years. An array of important museums, however, has been inaugurated; Mohamed Nagui Museum, Modern Egyptian Art Museum, Museum of Mohamed Mahmoud Khalil and his wife, Museum of Ahmed Desouki, Port Said Museum for Modern Arts, Taha Hussein Museum, and the Mummification Museum in Luxor. In 295 BC, the Egyptian Ruler Ptolemy I Soter, commissioned the construction of the Great Library of Alexandria (one of the cultural wonders of the ancient world). In the following years, local scientists traveled through the region to purchase books for the library. The Library held many copies of important books of the ancient world as well as the originals of Euripides and Sophocles. All human knowledge of the ancient world was stored in the Library, not just of Egypt or the Greek territories, for Ptolemy I sent his representatives throughout the known world to collect reference works. In 48 BC, the Library and at least 40,000 scrolls were burnt when Julius Caesar attacked the city (during the Alexandrian war) and a huge fire swallowed up the ancient Library. It would seem that this was the end of the fabled library and thus the end of a legend, but 2,000 years later, after 10 years of planning, the Egyptian government and UNESCO have combined their efforts in order to revive the ancient Library. The Alexandria Library has now risen from the ashes of antiquity so that it might once more lead the world as a cultural center and a focal point for knowledge not only in Egypt, bur for the world as a whole. As part of the library, a new and very important antiquities museum has been created in order to highlight the history of Alexandria across the ages. It specifically highlights the cultural era of the Hellenistic world, providing exhibits related to knowledge and the arts. The museum was ceremonially opened in January 2003. It now contains rare artifacts from the Pharaonic, Greek, Roman, Coptic and Islamic eras. These artifacts are displayed in chronological order, representing the evolution of writing, the birth of scholarship and librarianship, and the ancient arts with informative displays presenting mosaic, portraits, glassware, pottery, coins, textile and much more. The museum is housed in section B1 of the Library complex on the ground floor of the main building. After passing through the security gate of the Library, take the stairs that lead down to the ground floor. On the right side of the stairs is the ticket office. General admission costs 10 LE for foreign tourists, and 4 LE for Egyptians. The admission charge includes the services of a guide, who will conduct a tour through the long corridors. The guides are proficient in English, French and German (and of course, Arabic). Within the museum, one will immediately be astonished by the noticeable harmony between the interior design of the museum and the displays within. Finely coordinated exhibits are well lit and aesthetically pleasing. The moment one steps inside the museum a beautiful Tableau hanged on the wall catches the eye. It is of a school girl, who sits on a stool copying out her lesson with a wooden stylus on a waxed tablet. It says of the statue that, "Education for girls as well as boys flourished at the ancient Library of Alexandria as attested by this Terra cotta statue dated circa 200 BC". Lets explore the museum and see what sort of ancient wonders reveal themselves. In the halls dedicated to ancient Egyptian artifacts, displays teach us particularly about the development of writing. Here, we find various statues of ancient Egyptian scribes and there, a collection of writing tools from the Pharaonic period. There are displays devoted to papyrus with an illustrated history of its use in Egypt as well as documentation on the evolution of writing through the period. A limestone Fragment of a stela which bears part of seven columns of hieroglyphic inscription from left to right in praise of the God Amun. The fragment still retains its original colors. It dates to the New Kingdom when the cult of the God Amun spread and flourished and he became the official God of the Egyptian Empire. There is also space provided for Alexandria's sunken antiquities. It is believed that, due to a series of violent earthquakes, the northern parts of the city were lost to the Mediterranean sea. Archaeological exploration to recover these antiquities actually began in the gulf of Abu Qir in 1933 and in the Royal district (eastern harbor) in 1961, when the Egyptian Kamal Aboul Sadat reported seeing sunken monuments in the depths of the eastern port area, which faces Qaitbey Fort. At first, divers retrieved a few pots, but soon they were also bringing up gold coins dating to the Byzantine period. Then they discovered a granite statue of Isis measuring 7.5 meters in height, spurring additional interest. In 1968, the Egyptian government requested assistance from UNESCO in the development of a map of the sunken antiquities in the eastern port area. UNESCO responded positively and the resulting map became the guiding reference for current work in the area. Above: A white marble head of the god Serapis with inlaid eyes and a hole on the top for fixing a Kalathos. At left is the statue as it appeared when first discovered underwater, while at Right it is now in the Alexandria Library Museum. In 1993, The European Marine Institute, a French expedition under the direction of famed under water excavator Frank Goddio, began work in both the eastern port area and at Abu Kir. The expedition was comprised of thirty Egyptian and French divers, and their work revealed thousands of items in the shadows of the Qaitbey Fort, including Pillars, crowns and statues. Jean Yves Empreur, one of the French archeologists, explains that the finds were almost certainly the remains of the ancient Pharos Lighthouse of Alexandria, which was one of the wonders of the ancient world, toppled by one of Alexandria's ancient earthquakes. Above: A huge Royal head of Octavius in Gray granite wearing the Nemmes headdress. It dates to either the very end of the Ptolemaic (Greek) Period or the beginning of the Roman Period. Dimensions: H. 59 cm – L. 59.5 cm. Provenance: Eastern harbor. Many of the artifacts from these underwater excavations are now in the museum's collection. These artifacts require special treatment due to their submergence in salt water which results in salt accumulations in the epidermis (skin) of the stone. After being removed from the sea, they are immediately placed in water tanks with the same solution of sodium as in the seawater. Then the sodium solution in the tank is gradually reduced, which results in the sodium within the artifacts slowly being released into the fresher water. Eventually, after about six months, the artifact is cleansed of its salt content and the process is complete. Only then can the piece be exposed to the open air without damage. Of course, the Alexandria Library was at the center of the Greco-Roman world, hosting both scientist and philosophers. Here, Archimedes invented his pump still in use today and known as Archimedes’s screw. Euclid wrote “Elements” (the base of Euclidean geometry) and “ Optics” (a treatise of geometrical optics). They were not alone and many famous scholars worked to, for example, isolate the function of the heart, calculate the circumference of the earth and even develop the concept of the leap year. In fact, the loss of the library in ancient times basically resulted in the loss of the combined knowledge of the ancient world. Above: A white marble bust of Xenfon, which bears his name in Greek and dating from the Greek Period. Dimensions: H. 59 cm Below: A gold wedding Ring discovered at Abu Kir and dating to the Byzantine Period. Within the Greco-Roman section of the library we find many statues of the most important Greek philosophers, orators, writers and historians, together with other artifacts of the period. Here, there is a glass cabinet which displays a collection of Golden Jewelry, rings and coins discovered at Abu Kir (1999-2000), some of which date back to the Greek Period. Above: Terra cotta cinerary urn :(Hadra Hydrae) were used to keep the ashes of deceased. They are named after the place where they were originally discovered in a region called “El Hadra” at the southern boundaries of the ancient city. They date back to the fourth century AD. The oldest of these Hydrae had a white background and this was also found in Athens, Rhodes and Cyprus where other Ptolemaic monuments came to light. Hydrae were manufactured in Alexandria and were usually decorated with geometric and floral designs, theatrical masks, mythological scenes and representations of deities in relief. Some of those vases were inscribed with the name, date of death and title of the deceased. Above: The lid of a sarcophagus, which depicts a child lying down on his left side, putting his left hand under his head and wearing a dress with folds in high relief. This piece dates to the Roman Period. Textile were the most distinguished product of Coptic Christian art. Thousands of pieces of textiles were found in Egypt, dating back to the Roman, Byzantine and Islamic eras. Most of them were woven of wool and flax and were characterized by the richness of their decorations which comprised geometric, floral designs, human figures, Christian motifs and even scenes from mythology. Coptic textiles had many uses during Egypt's Christian period, including bed sheets and covers, towels, napkins, tablecloths and carrying sacks, while in churches and other public buildings, these decorative fabrics were used for curtains and hangings. Most commonly, textiles during the Coptic period were used for clothing which, during that time period, most frequently took the form of a tunic, or rectangular shirt-like garment which was usually fastened at the waist by a belt. Textiles were also used for belts, cloaks and shawls. The tunics of Copts was most often made of plain wool or linen and adorned with either a single vertical band (clavus) that ran down the center of the garment, or two vertical bands (clavi) that fell over each shoulder and ran down to the knee or the bottom of the garment on both the front and back. 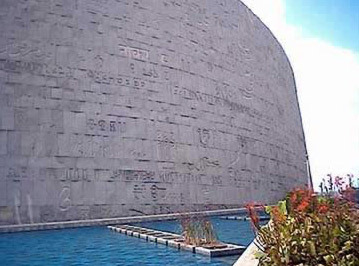 The Library of Alexandria's Museum also contains items from the Islamic Period. This was a period when Alexandria experienced its loss of status as the Capital of Egypt to what would eventually become Cairo. The museum contains collections of Arabesque wooden windows, carpets, tablets and lanterns. Notably, in the seventh century AD, glassmaking flourished in Egypt and glassmakers inherited many of the techniques of their forbearers in the Byzantine and Sasanian empires. These included glassblowing, the use of molds, the manipulation of molten glass with tools, and the decorative application of molten glass. Islamic glass production from the seventh through the fourteenth century was also greatly innovative and witnessed glorious phases, such as those of superb relief-cut glass and spectacular gilded and enameled objects, that established its supremacy in glassmaking throughout the world. Prior to building the new Library of Alexandria, excavations were conducted on its future site in 1993. From this archaeological investigation, several unique Mosaic pieces immerged. For the first time, in the Alexandrian museum, there is a hall devoted to the mummification process which not only provides information on ancient Egyptian mummification, but on this funerary practice in Predynastic times and during the Greek and Roman Periods. Currently this hall has on display three mummies from different eras (ancient Pharaonic, Ptolemaic and Roman). One is the coffin of an individual known as Aba, son of Ankh-hor, who was the governor of Upper Egypt and head of its treasury. This wooden coffin is decorated with colored designs and hieroglyphic inscriptions including the Book of the Dead. It still retains much of its original colors. The mummy was brought from the excavation carried out by the Belgian mission at Asasif Necropolis (part of the Tombs of the Nobles) on the West Bank of ancient Thebes (modern Luxor). The exhibit includes four canopic jars that were used to preserve the organs of the deceased. A second wooden coffin belonged to a Greek woman, who was also mummified. It is decorated with colored representations as well, including depictions of a winged goddess Isis. During this period, we know that it took only forty days for the mummification process, as opposed to the seventy days required during more ancient times. The third mummy, without coffin, is that of a Roman woman wrapped in linen bandages and covered with five pieces of cartonnage. There is also a collection of small funerary figures. These are often referred to interchangeably as Shabti, Shawabti and Ushabti, though in reality each of these terms refers to certain types of funerary figures specific to a time frame or location. Initially, these magical figures were believed to act as a substitute for the deceased himself, although later they came to be regarded as mere servants in the afterlife. Hence, at first they were sometimes fashioned either as mummies or as living persons dressed in fine linen garb, but in later periods their appearance changed more to that of servants. A spell for this purpose appeared in the Middle Kingdom Coffin Texts, and from the New Kingdom the figures were inscribed with Chapter six of the Book of the Dead. The museum of Islamic art is truly a wonderful reservoir of Islamic antiquities. It has a vast supplement of about 10200 artifacts that one cannot explore in a single day. The museum displays arts from the different Islamic eras that Egypt passed through including the Fatimid, Turkish and Persian periods. From the Fatimid Period, one can find a fine collection of wooden panels, which are the only surviving pieces of the Western Palace of Al Kahira Palace. And people love the craftsmanship of the Mihrabs of the tombs of Sayeda Ruqayya and Sayeda Nafeesa. From the Ayyoubid Period one may find the beautifully carved wooden tabut (casket) of Al Hussein in addition to fine inlaid brass candlesticks. From the Mamluk period there is a collection of enameled mosque lamps as well as inlays of metal, wood and marble on pieces of furniture and various objects. And the Tatar El Higaziya provides us the minbar from their Madrasa (Mausoleum). The boxes of the Quran that once belonged to Sultan Shaaban are real pieces of art representing meticulous crafting. The beautiful Iranian and Turkish carpets are simply eye catching. The courtyard area contains a lovely nineteenth century Fountain obtained from the Monasterli Palace on Rhoda Island. These antiquities are only a fraction of the displays in the museum. They are only examples of the most prominent artifacts in the museum. The museum of Islamic Art is in Bab El Khalq Square in the Egyptian library. Take Port Saed Square to reach the intersection with Muhammad Ali St. in Ahmad Maher Square. The museum is open throughout the week from 9 am to 4 p.m. except on Fridays, when it is open from 9:30 am to 11:30 am and from 1:30 p.m. to 4p.m. On the other hand, in you take a look at Cairo you will find Islamic architecture every where. Old (Historic) Cairo is an open museum of the beautiful architecture of Islam where one may find that geometrical shapes are the main elements of this fine art. This is because in Islam it is thought that images of people is a return to pagan idolatry ages. So instead, Islamic art is uses designs (arabesque). Islamic art has changed with the change of ruling periods. This evolution of Islamic art started from the Fatimid period. Examples of architecture of the Fatimid period are the Azhar mosque and El hakim Be Amr Allah mosque. The following period was that of the Ayyubids, and the citadel is the best example of the art and architecture of this time interval in Egypt. The Mausoleum of Sultan Al Mansour Qalawon symbolizes the Bahri Mamluk period. The Circassean Mamluks follow the Bahri Mamluks and they built many educational buildings like the Mausoleum of El Zahir Baybers and the mausoleum of Sultan El Ghuri. The mosque of Mohammed Ali embodied the Ottoman period. The last time I was in the Citadel to visit the military museum I noticed the Police Museum, which seemed interesting, so I decided I would have to make a return trip to visit it as well. I was beginning to get used to the long stretch leading up to the entrance of the Citadel. Today, there was not as much security as on several other visits. I only had to pass through the metal detector gate and then I was inside the Citadel. As usual, there were many school groups visiting the Citadel. It is considered one of the most popular school trips. And as usual, there were many tourists. The Citadel is large, but I have now gotten to know my way around, and I knew exactly where to find the Police Museum. The Police Museum is a huge building with small windows that were once probably used by archers. There is an Egyptian flag atop the gate, and the gate itself is ancient, decorated with simple old Islamic arabesque. To the right, I found another sign pointing to the Police National Museum. Next to the stairs of the museum, there was a huge statue of a lion. I think it's not ancient. It looked like it was made by a famous Egyptian sculpture such as Mahmoud Mokhtar as a gift to the museum. Once inside the museum, the first corridor contains portraits of Egyptian ministers throughout history. It is not very interesting, other than for observing the changes in their clothing throughout time. After that, the first hall of the museum consists of weapons used by the Egyptian police throughout time, including the Pharaonic Period. In fact, there were many ancient shields and weapons in the hall, along with modern guns, mostly of British origin due to the British occupation of Egypt. There are also some shields and helmets from the Islamic Period, including one helmet dating to the Islamic year 11. It has Arabic sentences from the Qura'n meant to protect the soldier who wore it. The next hall is the Ismailia battle hall. 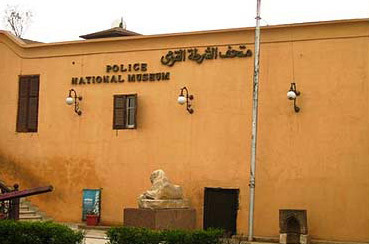 It contains displays related to the battle of the Egyptian police against the British occupiers in 1951. This was one of the main triggers of the Egyptian revolution in 1952. This hall contains some real pictures of the battle and some weapons the Egyptians and the British used. In the middle of this small hall there is a small scale model of the police station in Ismailia and of the battle that took place. The crimes hall is the most interesting in this museum. At various points in time, money forgery has been a problem in Egypt, and there are displays of printing machines and of counterfeit bills that look very real. Some criminals even produced fake coins, which was a difficult task, as well as other currencies including American. Then there are displays of the famous Egyptian criminals through time. One is of Mahmuod Amin Mahmoud, who was born in 1929. He lived in many different places like Maadi and Darb Ahmar and he committed more than 30 crimes of theft and murder. He eluded the police for many years, but died in 1960 in a battle with them. There are a number of displays, including a few real pictures of this scary individual. However, to the left of Mahmuod Amin there is a display of the most famous criminals in modern Egyptian history. They are Rayya and Sekina, two sisters who organized a prostitution ring at the beginning of the last century. That wasn’t their main crime though. They would kill women and steal their jewelry and money and then would bury them in an apartment the sisters owned next to the police station in Alexandria. One of their ploys was to approach women in the market and convince them to come back to their apartment to look at clothes they had for sales. Once the victim entered the apartment, they would kill her, rob her of whatever she had, and bury her in the same apartment. It was very hard for the police of Alexandria to capture them but they eventually did. The remainder of the displays in this small museum are mainly historic items that the police confiscated from those trying to smuggle the artifacts out of the country. Most of these are small statues that date back to the Greek Period in Egypt. To be honest, I was a bit disappointed with the Police Museum, but I suppose it was worth a quick visit. Egypt is really working to upgrade their museums, and many of the newer ones, such as the Luxor Museum, are very nice and employ modern museum sciences. This one is not one of those at this point. Of course, we do try to inform tourists of what might, and might not be very interesting. Dr. Taha Hussein (1889-1973) is the doyen of Arabic literature and one of the most celebrated figures of Egyptian contemporary cultural and intellectual history. He emerged from the Egyptian countryside and from the cloisters of Al-Azhar University to enrich the Arabic library with more than fifty books dealing with literature, history, philosophy and education. Almost all his books have been translated into several languages. Dr. Taha Hussein transcended the reality in which he lived by opening up to the study of humanities without losing his originality. He was awarded more than 36 Egyptian and foreign decorations foremost among which was the Collar of the Nile which is the highest decoration in Egypt conferred on Kings and Heads of State. He also obtained the United Nations Prize for his achievements in the field of human rights. He occupied senior university posts including a professor of ancient history of Arabic literature, dean of the Faculty of Arts at Cairo University, a general supervisor or of culture at the Ministry of Education, Rector of Alexandria University, and chief Editor of "A1 Katib A1 Araby" (The Arab Scribe) magazine. In 1950 he was selected as Minister of Education. He introduced a number of reforms most important of which was the establishment of the principle of free education in Egypt. In recognition of all Dr. Taha Hussein's achievements for Egypt the State bought his residence in the Pyramids district after his death and converted it into a museum carrying the name "Ramatan" which literally means in Arabic the two oases where traveling caravans stop to take rest. As Dr. Taha Hussein was keen on having his son Dr. Moeniss share his residence, he designed the villa with two entrances to preserve each one's privacy and freedom. That is why he called it "Ramatan" or two places of rest for him and his son. The museum or "Ramatan" is made up of two stories. The ground floor houses Dr. Taha Hussein's study and a part of his 7,000 book library, a great reception hall where he received men of letters, politicians and artists every Sunday evening. In one of the corners of this hall stand a huge piano, a gramophone and records of rare musical works by Schubert, Verdi, Bach, Mozart, Schumann and others. The top floor has three bedrooms and a small hall where there is a closet enclosing all the decorations, medals and orders which the Doyen received during his lifetime. The garden has a bust for Dr. Taha Hussein by the noted Egyption sculptor Farouk Ibrahim. A smaller building designed in the same style of the villa has been converted into a cultural center which will be used for holding seminars and cultural exhibitions to keep Dr. Hussein's legacy alive . He was born in Upper Egypt and lost his sight at the age of three. Taha Hussein is the doyen of contemporary Arabic literature and a pioneer of enlightenment. When he assumed office as Minister of Education in 1950, he managed to put his motto, "Education is like water we drink and the air we breath," into practice. In 1914, he received the first doctorate granted by an Egyptian University. He succeeded in making all elementary and secondary education free. In 1918 he obtained another PhD in Social Philosophy from the Sorbonne, Paris. In 1919 he received a diploma in post-graduate studies in the Roman Civil Code from the same university. He was granted honorary doctorates from the universities of Oxford, Madrid, and Rome. In 1919 he was appointed a professor of history at the Egyptian University. He did not confine himself to political and constitutional history but transferred to his students his knowledge of Greek drama such as Sophocles and Aeschylus. The greater part of Taha Hussein’s canon is basically influenced by Greek culture. He issued "Selected Pages" from Greek Dramatic poetry (1920), "The Athenian System" in 1921, and "Leaders of Thought" in 1925. Thus, the link between his Arabic culture with that of Greece was a turning point as thinker. The first book was an incomplete attempt at an expose of Greek poets and their works. The second book was a meticulous translation of one of the most important texts of Greek history of civilization. He deals with the religious impact on thought in the Middle Ages, then moves on to the Modern Ages of multi influences. Thus, Taha Hussein was not merely influenced by Greek thought in his literary work but also in his books on politics and civilization. The books he issued following his return from Paris greatly influenced modern Arabic classical literature. He waged many battles for enlightenment, the respect of reason and thought, and women’s emancipation. The first of these was in 1926 when he issued "Pre-Islamic Poetry", which was highly controversial in both politically and literary circles. It aroused wide-scale front page arguments in newspapers between supporters and opposers. In self defense he argued that he adopted a scientific method of approach in his treatise on Pre-Islamic poetry. That method, he said, was adopted by western philosopher scientists and men of letters who followed the French philosopher Descartes in his reasoning in search of the truth of beginning. It renovated science and philosophy and changed the outlook of men of letters and artists in the West. Arts Lovers, and Mr. Khalil became the chairman of the society from 1942 to 1952. In 1960 , his wife died after donating the palace and its contents of masterpieces and rare artifacts to the State to become a museum, carrying the name of Mahmoud Mohamed Khalil and his wife . Mohamed Mahmoud Khalil’s palace was constructed in Giza around 1920, on the French style (Ardico), which was well known in France at that time. The eastern side of the palace, overlooking the Nile, carries some features of the (Arnoveau) Style that appeared in France in 1875, as evident from the metal and glass skeleton above the entrance of the palace. The surface area of the palace is 1400 squared meters, and the palace has four levels. The palace was inaugurated for the first time as a museum on July 23rd,1962. 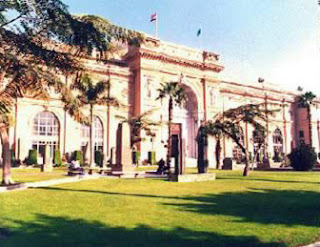 The museum was moved to the Prince Amr Ibrahim’s palace in Zamalek, Cairo, in July 1971. 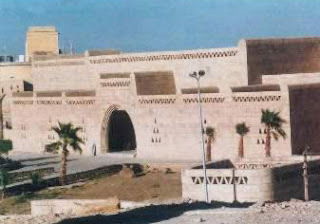 After remodeling, the museum was moved back to Mr. Khalil’s palace in September 1995. When the Ministry of Culture decided to add to its series of specialised museums one for of Islamic ceramics, it chose the palace of Prince Ibrahim in Zamalek built in 1343 H. (1924 A.D.). Undoubtedly, this choice was inspired by the palace’s impressive Islamic architecture and dercoration, as well as its location in a quiet and fashionable district in the heart of the city. This splendid palace, a masterpiece in its own right, provides an ideal setting for the precious works of Muslim ceramists throughout Islamic history. The Museum of Islamic Ceramics, inaugurated late 1998, is an integral part of the renovated and refurbished Gezira Art Centre affiliated to the National Centre for Arts, Ministry of Culture. The first of its kind in the Middle East, it houses a rare collection of ceramics acquired from different Islamic countries that represent various techniques of decoration applied in the Islamic world from Morocco in the west to Iran in the east. The collection comprises 315 pieces, of which 116 are from Egypt representing popular styles from the different Islamic eras, Umayyad, Fatimid, Ayyubid and Mamluk, 118 pieces in Turkish style ( Iznik and Kutahia ), 25 pieces in Syrian style (Al-Raqqa), 48 pieces in Iranian style, 2 pieces in Andalusian style, 2 pieces in Iraqi style and one piece in Moroccan style. The ceramics include vessels, jars, tiles, mugs, jugs, bowls, plates, pitchers, vases, lanterns, cups, the oldest dating back to second century Hijra and the most recent dating back to twelfth century Hijra. The pieces, carefully selected from the acquisitions of the Gezira Museum (150 pieces) Islamic Art Museum (159 pieces) and 6 pieces from the very palace that houses the Museum of Islamic Ceramics, are displayed on two floors in a total area of 420 square meters. The Mukhtar Museum was built to house the sculptures of Mahmud Mukhtar who is considered to be one of the greatest Egyptian sculptures. The building was designed by Ramesses Wissa Wassef and houses eighty-five bronze, stone, basalt, marble, granite and plaster works. One building contains a Planetarium, the Gezira Museum and the Museum of Egyptian Civilization. 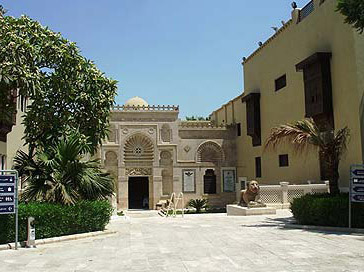 The Gezira Museum contains objects that were collected by the royal family. The Manial Palace is said to have been built for Prince Mohammad Ali between 1899 and 1929. The palace was given to the Egyptian nation in 1955. Prince Muhammad Ali is the first cousin of King Faruq and the younger brother of Khedive Abbas II Hilmi. The complex consists of six structures. Among these structures is a museum in which Faruq's hunting trophies are found, the prince's residence and furnishings and a museum in which some of the family's memorabilia are found. There are also gardens that have beautiful plants and flowers that are worth seeing. The palace also includes a collection of manuscripts, carpets, textiles, brass work and crystal. Items that can be seen here are a table made of elephant ears and a 1000-piece silver service. On part of the original grounds a hotel has been built called the Meridian Hotel. The Luxor Museum is surprisingly entertaining. Displays of pottery, jewelry, furniture, statues and stelae were created by the Brooklyn Museum of New York. They include a carefully selected assortment of items from the Theban temples and necropolis. There are a number of exhibits from Tutankhamun, including a cow-goddess head from his tomb on the first floor and his funerary boats on the second floor. However, some of the real attractions include a statue of Tuthmosis III (circa 1436 BC) on the first floor, and 283 sandstone blocks arranged as a wall from the ninth pylon of the Karnak Temple. The hours for the Museum are from 9 am to 1 PM and then from 4 PM until 9 PM. in the winter. Afternoon hours in the summer are from 5 PM until 10 PM. The Kharga museum not only has displays from pharaonic, Ptolemaic, Roman and the Christian eras, but also considerable information on prehistory, including artifacts. Most of the displays were derived from the Kharga and Dakhla oasis. Museum hours are from 8 AM until 4 PM. Here, Muhammad Ali waited while his forces trapped, and put an end to the Mamluk beys by massacring most of their leaders as they were leaving the Citadel. The Kasr (Qasr) El-Gawhara or Jewel Palace, originally Mohammad Ali Pasha's headquarters, is now open to the public as an example of the best early 19th century Ottoman decoration and architecture. Its collection includes 19th century royal portraits, costumes and furnishings. Constructed in 1814, it includes a small garden leading to a mosque with one of the more interesting eccentricities being the Watch Hall where the shape of a watch has been used to decorate the walls. Many artifacts found within the Fayoum region are housed in the Karanis Museum. Displays include delicate glassware and pottery, females heads (as found in Alexandria) which are thought to have been used to model hairstyles, and a Fayoum portrait. Many of the mummies found in this area had portrait of the deceased painted on them. The museum is well laid out, and has recently been renovated. 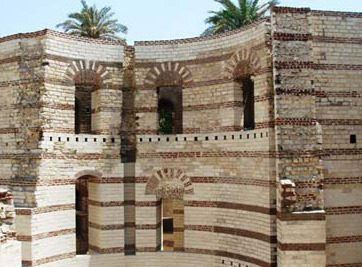 The Ismailia is a small museum but has over 4,000 artifacts from pharaonic through the Greek and Roman era. It includes information on the first canal built by the Persian Darius between the Bitter lakes and Bubastis and a masterpiece mosaic of the 4th century illustrating classic characters from Greek mythology. Other items include statues, scarabs, stelae and such. The museum is open daily between 9 AM and 4 PM. It was with great excitement that the new Imhotep Museum was opened in April 2006 by Dr. Zahi Hawass, Secretary General of the Supreme Council of Antiquities. A modern museum, both in technology and security, this is a place not to be missed on your next visit to Saqqara. 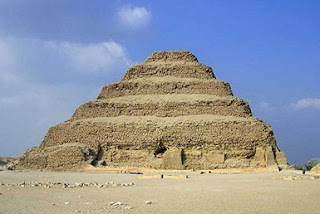 Located twenty kilometers south of the Giza Pyramids, Saqqara is the site of the Step Pyramid and the funerary complex of King Zoser (Djoser), the Pyramid of Unas, the Teti Pyramid, Old Kingdom tombs with scenes of daily life, and much more. The Step Pyramid of Zoser is Egypt's first pyramid, designed by Imhotep, for whom the museum is named. The sands of Saqqara have yielded treasures from the Archaic Period, the Old Kingdom, Middle Kingdom, New Kingdom, Late Period and Greco-Roman Period. And there is still much yet to be discovered! The excavations are continuing and each season more treasures are found. In 1997 the building of the new museum began. The idea was to have a special place dedicated only to the many discoveries from this area. Located near the entrance, not far from where the ticket office was formerly located, visitors will be pleased to find artifacts that are attractively displayed, well air-conditioned buildings and modern toilet facilities. The museum consists of five halls: 1) Theater and model of the funerary complex, 2) Main Hall including the architectural elements, 3) New Discoveries, 4) Model Tomb Hall, and 5) Library of Jean-Philippe Lauer. In the theater visitors can watch a short film made by National Geographic about the Imhotep Museum. In the center of the room is a model of the funerary complex showing the Step Pyramid and surrounding buildings in brilliant white, the way they would have looked when they were new. The model was constructed by Jean-Philippe Lauer (1902-2001), an archeologist that made many discoveries at Saqqara and dedicated his long life to restoring these monuments. One of the halls of the museum is dedicated to preserving his library. The most noticeable feature of the Main Hall is the blue-green faience. These tiles were collected in the anti-chamber and burial chamber of the Step Pyramid and reconstructed to show visitors how the walls of these chambers and those of the Southern Tomb would have looked in ancient times. There is also a statue is of a scribe, Ptah-Shepses (5th Dynasty) from Abu Sir. There are two types of scribe statues – reading and writing. This statue of Ptah-Shepses is a reading scribe. An impressive collection of large alabaster jars, some over one meter high, date back to the 2nd and 3rd Dynasties. These jars came from the chambers below the Step Pyramid. Included in the display is a block that shows the steps to making the alabaster jars. One of the masterpieces now displayed in the "New Discoveries" hall of the museum is a mummy that was found during recent excavations around the Teti Pyramid. When we moved the sands we found a mummy that was the most beautiful mummy I have ever seen. When I saw the mummy for the first time I was shocked. The colors looked like it was painted yesterday – yellow, blue, red and black. We know that it dates to the 30th Dynasty, but regrettably we do not know the name of the owner because there were no inscriptions to tell us. The mask is gilded. The mummy itself was wrapped in linen and is 176 cm in length. The casing is painted with scenes. On the chest there is painted a pectoral with a winged scarab. On each side there are five gods holding scepters. Under the necklace there is a winged goddess, Ma'at, with two feathers. On the legs of the mummy are scenes of the god Anubis performing the mummifications. Also in this hall are artifacts found during the excavations of Dr. Zahi Hawass near the Tomb of Qar. This newly discovered tomb was owned by a dentist from the Old Kingdom. There are surgical tools and bronze statues of the gods and goddesses, including Isis, Horus, Osiris, Ptah, Anubis and others. Dr. Zahi Hawass has made enormous contributions to Egyptology. Doing excavations, restoring monuments, opening new museums, publishing numerous books and articles, recovering stolen artifacts and increasing public awareness about Ancient Egypt and the new discoveries through the media, under his leadership the face of Ancient Egypt in today's world has reached heights never before achieved. Just as the Ancient Egyptians might say, "His name will live forever." Hall #4 contains a model of a small tomb and shows the typical burial elements, including the coffin, a wooden statue, pottery jars and offerings. There are also some offering jars that still contained some cheese when they were found! Other pieces in this hall include a pyramidion that was found by Dr. Zahi Hawass near the Teti Pyramid, some limestone maces, a wooden coffin from King Mery-en-Ra of the 6th Dynasty, a limestone block with pyramid texts from the Pepi I Pyramid, some canoptic jars of alabaster, and a limestone sphinx of King Unas. Despite all the wonderful things on display here in the museum today, we are still looking for more. Perhaps someday we may even unearth the tomb of Imhotep himself. It is said that only 30% of the treasures from Ancient Egypt have been discovered to date. Who knows what we may find tomorrow, or next week, or next year, or… the excitement and suspense of the search continues. No one knows what the sands of Egypt may hide, only that it will continue to yield the secrets of time. This article was written by Ashraf Mohie El Din, an archeologist/Egyptologist presently working at Saqqara, and Ruth Shilling, an AETBI member and owner of All One World Egypt Tours. All photos are by Ruth Shilling. 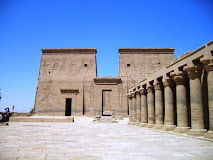 For additional information about the authors: www.Ashraf-EgyptTourGuide.com and www.1worldtours.com. The museum was first built in 1892 as a small building located on Horreya Road. In 1895 it was transferred to the present site near Gamal Abdul Nasser Road. It started with eleven galleries, and has been gradually enlarged in later renovation stages. 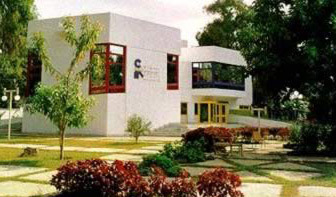 The 25th gallery was inaugurated in 1984. It contains a very big variety of coins from different countries, chronologically arranged, and dating back from 630 BC to the Ottoman period in the 19th century. The collection, which covers the period from the 3rd century BC to the 7th century AD, is a fascinating record of civilization in the process of change as religions merged and society evolved. In Alexandria, Graeco-Roman and Pharaonic religions mingled in the cult of Serapis; the shift from pagan religions to Christianity can also be seen in the exhibits which include mummies, Hellenistic statues, busts of Roman emperors, Tangara figurines, and early Christian antiquities. The museum contains hundreds of precious antiques. We will describe the most valuable ones or the best areas in the museum. Honestly, I have been to that museum more than five times and I still would love to go again. In Room 6 we can find The Apis Bull, found to the west of Pompey's Pillar. The statue was set up in the reign of Hadrian (AD 117-138). This bull represents the most successful imposition of Greek realism upon an Egyptian image. The Serapis Head is sculptured with fine white marble. It was found near the Pompey's Pillar. It was one of the Ptolemies' gods. This god was a blend of Osiris and Apis. A visitor can see fine mosaics, an Alexandrine specialty, including one of a ship sailing, done with colored pebbles set in cement. This is the earliest type of mosaic made. Room 7: The two headless sphinxes, carved under Amenhemhet IV (12th Dynasty), are spectacular. The two headless black basalt statues of Isis in the niches flanking the doorway show us a clear example of Isis Knot. Room 8: This room is devoted to mummies and sarcophagi. A visitor can see the difference between the gilded and painted cartonnage of the pharaonic mummies and the ornate diamond bandage of the Ptolemaic ones. Room 9: This room is mainly dedicated to show pieces of a shrine in the Fayoum dedicated to the Crocodile-god, Pnepheros. Room 11: Contains some of the most interesting statues, in which Egyptian scenes and techniques are portrayed with Greek influences. We can see image of divine serpents " The Agathadaimon Stelae" and their worshippers. Limestone fragments from a temple at Athribis (Benha) are along the north wall of the room. The god Tutu faces Horus and Athribis with a broken inscription of Greek between them. Room 12: Contains statues of Graeco-Roman period. A colossal red granite head of Ptolemy IV, was found at Abuqir, wearing the double crown of Egypt. The mosaic of Medusa, once a pavement, originally showed Medusa's entire body. The most spectacular piece is the colossal white marble statue of Marcus Aurelius (121-180 AD), which was discovered under the Sayed Darwish Theater. In the same room, we can see a marble statue of Isis as a goddess of the Nile reclining against a sphinx. Her left hand holds a vessel for the Holy Water and the eight children climbing over her represent the eight cubits the Nile rises for a perfect flood. Room 14: is filled with portrait heads of famous Romans: Hadrian, Vespasian, and Augustus. Room 16: Contains some of the finest Hellenistic statuary available. The torso of Aphrodite is magnificent . At the end of the hall are a couple of male torsos, a female, and a seated male, which belonged to a group of statues carved for a pediment for a palace near the eastern harbor. Room 17: Contains some of the best Sarcophagi found. The most unique one shows Ariadne asleep on the island of Naxos. The god of sleep (Hypnos) stands by her head, and behind him lies the boat that brought her from Crete. Her husband, Dionysisu, stands in front of her with his retinue. The rest of the facade shows a drunken Hercules being helped homeward. Room 18: The funerary amphora from Chatby. It dates to the end of the fourth century BC. It still has its artificial wreath of green leaves and golden berries around its neck. Another display is a unique collection of clay Tanagra ( an ancient city in the northern part of Greece) figures. This collection spans the 3rd century BC to the 1st century AD. It provides information about women's fashions, hairstyles, hats and dresses in the ancient world. Room 21: This room contains plenty of pottery and some statues. The statue that stands out in this hall is a Hercules statue with a club in his left hand and his lion-skin coat in his right. Room 22: This hall is dedicated to colored glassware. Early in Egypt's history, the people learned how to make glass. It is a chance to see the early discovery of the fusion of soda and sand. At the end of the hall is a beautiful bronze head of Hadrian (76-138 AD). Room 2:Contains many architectural elements from early Christian buildings, the central basket capital is a typical Coptic art. Room 3: This room has magnificent collection of metal, silver and gold. The silver torso of Aphrodite dates from the 2nd century. There is a varied collection of ancient jewelry with different magnificent colors. Room 4: Devoted to Coptic textiles from some of the finest weavers in the Christian world. Room 5: An amazing ancient model of a water cooling system. Room 1: In this room, we can see the beautiful alabaster Good Shepherd. Its large eyes and flat, regular of the robe is a development from the Coptic style. Part of the hall displays artifacts from the Monastery of St. Menas, west of Alexandria. The Sculpture Garden: The garden of the museum is full of spectacular statues and artifacts. The Egyptian Geological Museum was established and opened for the public in 1904, as a part of the Egyptian Geological Survey (EGS) founded earlier in 1896. The museum introduces visitors to Egyptian geology and history. Mining and metallurgy started many thousands of years ago, in predynastic times. Egyptians were the pioneers in extraction and utilization of metals and stones, the essential basics of civilization. They were the first to discover gold and copper and mine them from the Eastern Desert and Sinai. The first geological map known to us was drawn to represent the Fawakhir gold mine on a papyrus in the Turin Museum. Iron was smelted from ores in Aswan and smelting was also carried out at Naukratis and Defna in the Delta region. This added to the Egyptian power and prosperity. During the Ptolemaic and Byzantien periods, granite was quarried from Mons Claudianus, the Imperial Porphyry from Gabal Dokhan and the Breccia Verd from Wadi Hammamat . These were used in decorating palaces all over the Roman Empire. Egypt was also the first to produce famous types of glass. Precious stones, especially turquoise, emerald and peridot, were gathered and turned into very pretty jewelry by the ancients. The geological history of Egypt as indicated by it’s fauna and flora is displayed in the Museum. There is also the unique collection of the Fayoum vertebrate fossils on display and of course, a large collection of Egyptian and other minerals, ores and rocks. In addition, a very valuable collection of meteorites discovered in Egypt and from other places in the world are displayed. These include the famous Egyptian meteorite “Nakhlite” believed to be from Mars. The Museum is served by a library with references that date as far back as 1778, in addition to up to date references and bibliographies. These are available to the public and scientists. The Museum also includes some specialized laboratories for mineralogical, petrological and paleontological (both vertebrate and invertebrate) studies. Models for rare vertebrate fossils are made to facilitate detailed studies and preserve the original specimens. The Museum shares in the studies conducted on the protectorates and outstanding geological features in order to raise the public environmental awareness. Joint researches and cooperation with other international geological surveys, universities and museums are among the major concerns of the Museum. Cooperation with Duke University (U.S.A.), Toronto and Milano Geological Museums (Italy), The Museum of Natural History in London (U.K.) are good examples. Also, support to local museums in universities and schools is offered. This includes providing samples and training secondary school teachers and specialists from other scientific institutions. The idea of establishing a museum to exhibit modern Egyptian art masterpieces was first introduced in 1925 by Mohammed Mahmoud Khalil, a famous Egyptian fine art fan. Following a joint exhibition by Egyptian and foreign artists at the Cairo Arts Saloon, Khalil decided to purchase some of the exhibited items to be the cornerstone of the museum. The Ministry of Education paid LE 504 to buy 29 paintings and 11 curios of pottery. Khalil,the founder and chairman of the Egyptian Fine Arts Lovers Association, decided to display the art works in a large room at the association’s headquarters. Several years later, the donations of fine art aficionados filled the room and the Ministry of Education decided to move the museum to a new headquarters at Mousiri Palace. In 1931, the museum became an independent art authority. During the World War II, the headquarters was moved to several palaces with "Fin De Siecle Architecture". The genius Loci of these headquarters suited the rare items on display. In 1986, the government, through the Ministry of Culture, stepped in and decided to move the museum and its affiliated art and cultural activities to its current headquarters in Gezira. This headquarters was built in 1936 and designed by renowned architect Moustafa Bey Fahmi. It took the government five years of extensive work to prepare the building for displaying the rare collections of the museum. The building is now contributing to the development of the fine art movement in Cairo and the region. The Egyptian Museum of Modern Art now displays more than 10,000 paintings and sculptures that represent the development of the Egyptian art movement from the pioneers of the early 20th century to the contemporary art trends. Mahmoud Mokhtar : the first sculptor in the modern Egyptian art movement. Mohammed Nagui : a former diplomat who advocated his life to fine arts and reflected the Egyptian milieu, traditions and cultural heritage in most of his work. Youssef kamel : an impressionist artist who produced masterpieces about the Egyptian countryside and traditional markets. Ragheb Ayyad : a leading Egyptian artist who innovated a new trend using colored cartoons to express his themes. Ahmad Sabri : the pioneer of Egyptian portrait art. Mahmoud Said : an Alexandrian artist who quit his judicial career and dedicated his efforts to enhance the Egyptian Art Movement through his new style and techniques. The Egyptian Museum was first built in Boulak. In 1891, it was moved to Giza Palace of "Ismail Pasha" which housed the antiquities that were later moved to the present building. The Egyptian Museum is situated at Tahrir square in Cairo. 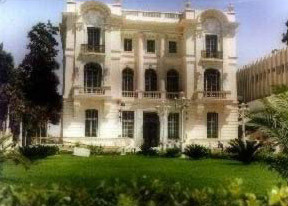 It was built during the reign of Khedive Abbass Helmi II in 1897, and opened on November 15, 1902 (More History). It has 107 halls. At the ground floor there are the huge statues. The upper floor houses small statues, jewels, Tutankhamon treasures and the mummies. The first section houses Tutankhamon’s treasures. The second section houses the pre-dynasty and the Old Kingdom monuments. The third section houses the first intermediate period and the Middle Kingdom monuments. The forth section houses the monuments of the Modern Kingdom. The fifth section houses the monuments of the late period and the Greek and Roman periods. The sixth section houses coins and papyrus. The seventh section houses sarcophagi and scrabs. A hall for the royal mummies was opened at the museum, housing eleven kings and queens. More than a million and half tourists visit the museum annually, in addition to half a million Egyptians. On the 93 anniversary of Denshway incident, Mrs. Suzanne Mubarak today inaugurates Denshway National Museum in Menofeya governorate. The museum was rebuilt to witness and immortalize the historic story of the Egyptian peasants’ struggle in Denshway village against the then British colonialism. The museum was designed by the consultative engineer Hany el-Meniawi to host all cultural activities besides Denshway incident. However, it comprises all historic documents on the event, as well as different instruments used in agriculture at that time such as the waterwheel and the shadoof. Besides an administrative building, the museum comprises 5 show halls in which all sequences of the historic struggle are represented, in addition to number of sculptures, paintings and a diminutive pattern of the old Denshway village made by the engineer Essam Safyy Al-Dein and the artist Mahmoud Mabrouk. The building also includes a roofless theatre, cultural centre, music hall, VIP’s hall and an atelier as well. The museum, built on an area of 2850 sq.m, cost some LE4 million, in addition to some LE1.5 million were allocated to the artistic purposes. In 1906, Denshway village was under the British colonialism. The British soldiers used to mistreat peasants, take their possessions, burn their crops and kill their children, women and old men as well. Such measures stir up people in Denshway, so, they resisted and revolted, by no weapons but their willingness and faith. First, they were able to make the British soldiers draw back but later, they were faced by different shapes of arbitrariness and many were killed. On the other hand, a British soldier died affected by a sunstroke but the British colonists were not convinced by the reason of the death and accused the peasants of killing him. Then there was a trial, a very unfair trial where 4 of the village’s youth were executed while many other were put in jail. The Coptic Museum in Cairo has been closed for some time for remodeling, but we are now celebrating its recent reopening, a welcome addition to Old Coptic Cairo. 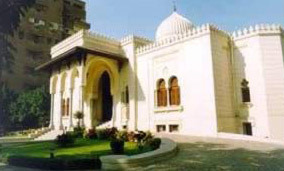 It is located in the heart of Coptic Cairo. Christianity has a long history in Egypt, and there continues to be a significant population of Christians in Egypt today. Besides the truly Egyptian heritage of Coptic Christians, there are also Roman Catholics, as well as a number of Protestant sects. Christianity spread in Egypt during the 2nd century in Egypt, just after and indeed during the Roman pagan period, and it became the dominant religion in Egypt up until the Arab invasion in 641 AD. Christian art, specific to the Coptics of Egypt, began to emerge around 300 AD. Though Christianity marked the end of the Pharaonic period in Egypt, and even though many traditions from that more ancient religion were carried over to become a part of not only the Christian faith in Egypt, but later even the Islamic faith, the art in form, style and content was very different from those earlier times. We can identify principally three reasons that Egyptian art made such a radical change. First of all, art was no longer such an imperial effort of the ruling elite, formalized according to the dictates of a small minority. The second reason is that Christianity delivered a very different message than that of the former pagan religion, and the art indeed changed to deliver this message. Finally, the social origins of Coptic art is perhaps best characterized as folk art. While there were certainly some professional artists centered mostly in Alexandria, at first, most of the Christian artists were local folk who did the best with their undertaking as they could. One interesting difference is that, by around 300 AD, three-dimensional art seems to have almost completely disappeared in Egypt, at least in the form of statuary. The last free standing sculptures in Egypt were those of Roman emperors, but the sculptures of the early Coptics, irregardless of the material used, were engaged, consisting more of an exaggerated raised relief. They usually faced the viewer directly, but they could also be half turned to one side. Over the centuries, these figures became flatter and more like conventional relief. This shift from three-dimensional representations probably also affected two-dimensional art. In traditional Pharaonic art, figures were most frequently represented in a combination of profile and frontal views, but Coptic art abandoned this old formula and turned the figure around to face the viewer. It is worth noting that much of this sculpture was originally coated with painted plaster which would have shown many details that are now gone. The most striking stylistic feature of Coptic figurative representation are the exaggerated rounded or oval eyes, under relatively thick eyebrows, and the contrapposto position (the weight of the body thrown onto one leg). Garments are often depicted with details of pleats and folds. The figures range from tall and slim to the short and thickset. Facial expressions usually span a narrow divide between non-committal to somber. Yet, some influences remained. As Christianity arose, the old indigenous religion and that of the Greek educated ruling elite had not yet vanished. Even though the style and form may have changed, Coptic Christian art featured a substantial amount of episodes from Greek religious thought, particularly the sculpture of Ahnas and textiles. The use of such motifs in a Christian context is somewhat puzzling, and we can really give no definitive solution to this, other than the overlap which occurred between these two cultures. In fact, it would certainly seem that a number of pagan themes were de-paganized and recycled to convey messages in keeping with Christian values. It has been argued that such themes themselves may have become a symbol of the triumph of Christianity over paganism. The largest collection of Coptic Christian artifacts in the world, with some 16,000 pieces, belongs to the Coptic Museum in Cairo. Indeed, this museum represents more than simply a collection of ancient Christian art. Perhaps no more so than for its western Christian visitors, it embodies the very instant when the old, pagan world collided with that of their modern Christian world. It is an eye-opener for many, as it documents this not altogether gradual but very significant moment in time. The first exhibition of Coptic art was held in Cairo during the nineteenth century in the "Salle Copte" at the Boulaq Museum. In 1908 Marcus Simaika Pasha founded the Coptic Museum on behalf of the Coptic Church. He chose for its location a unique place in Old Coptic Cairo, within the walls of the great Fortress of Babylon and surrounded by Cairo's oldest churches. With the support of Patriarch Cyril V he purchased artifacts from churches, monasteries, houses and private collections. The old, original wing of the museum is in itself a fine piece of architecture consisting of a series of large rooms, roofed over with ancient decorated wood and containing beautiful mashrabiya. Its walls are overlaid with fine slabs of marble, arches a and tiles. 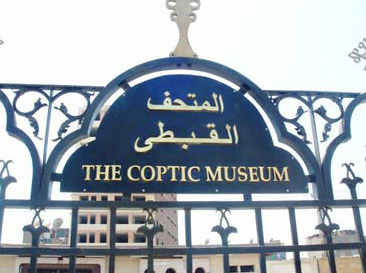 In 1931 the Egyptian government recognized the significance of the Coptic Museum and made it a state institution. Afterwards, the greater part of the magnificent Coptic collection in the Egyptian Antiquities Museum was transferred to the Coptic Museum in 1939. Then, in 1947 a large New Wing with a style complimentary to the old one was opened It too had carved wooden ceilings as well as picturesque fountains. It was later renovated with modern methods of exhibition and reopened on March 8th, 1984. Only recently was it once again renovated. The "General Catalogue of the Coptic Museum", an ongoing international project, was initiated in 1986 to compile an current catalogue of all the objects in the museum. The Museum's rich collection is arranged mostly according to media. The provenance of most Coptic textiles and minor works of art is usually unknown, but Coptic sculpture and wall paintings are better documented. The most important sites for these items are Abu Mina, Saqqara, Ahnas, Oxyrhynchos, Antinoe and Bawit. Nevertheless, many of the excavations that unearthed these items took place in the 19th century, and were therefore not as well documented as one might suppose. Furthermore, the re-use of older architectural elements, often from pharaonic monuments, makes exact dating of Coptic sculpture difficult. The majority of the monuments from which this collection was taken are in ruins. Mostly, architectural carvings, separate from their original context, including niches, pediments, friezes, lintels, consoles, columns and capitals, make of this exhibit. All of it was originally painted. During the 4th and 5th centuries pagan mythological scenes, such as Orpheus and Eurydice or Leda and the swan, continued to be depicted alongside Christian themes. The cross, supported by erotes or angels, is a central element of Coptic sculpture. Often, scenes of the christological cycle appear isolated, such as the Madonna and Child and the Holy Virgin with the saints. Scenes from the Old Testament are also frequently incorporated into sculpture. Examples include Daniel flanked by two lions or the Three Hebrews in the Fiery Furnace. On the other hand, at the monastic sites of Bawit and Saqqara there was a clear tendency towards geometric and floral architectural sculpture with niches and friezes. Also, aspects of daily life, such as the grape harvest or fishing in the marshes, are not uncommon in Coptic sculpture. Corinthian, basket and composite capitals were developed in a rich variety of abstract styles, especially discernable in the basket capitals of the 6th century. Basically a part of the Stonework collection, these objects are mostly limestone gravestones (or stelae) discovered at Terenuthis which was for the most part a Graeco-Roman pagan cemetery. Almost all of them fall into one of two categories. The first type have the figure depicted frontally and often flanked by two small jackal-like dogs representing Anubis, the lord of the necropolis, or Horus, the life-giving solar god as well as Anubis. A second type depicts a figure reclining on a kline and holding a cup in the right hand. Many of the stelae are framed by an architectural structure of two columns carrying a triangular Greek pediment. These items are essential to the understanding and evaluation of the origins of Coptic art. Alexandria was one of the principal markets for African ivory during the Greek Period of Egyptian history. By the Roman Period, Persia became more important for Indian Ivory, while bone, a much cheaper substitute, began to be widely used as well. 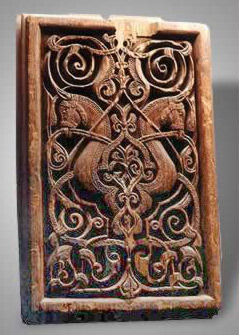 The Coptic Museum's collection of ivory and bone carvings consists of wooden bridal caskets of engraved bone or ivory plaques with naked human figures and nymphs, pyxides, bone figurines representing schematized female figures with cylindrical bodies; bone spindle whorls; pots and other objects of daily use. Included in this collection is the famous 6th century ivory comb depicting the Raising of Lazarus and the Healing of the Blind. Not surprisingly perhaps, considering Egypt's historic quest for rare metals, the Coptic museums collection of metalwork is a rich one, containing gold and silver, but also copper, bronze and iron. These pieces represent some of the oldest objects in the museum, dating from the 3rd to the 19th century. They come from monasteries, churches and towns, and may therefore be either religious objects or items intended for everyday use. The main group includes crosses, censers, lamps, bells, bible caskets, chandeliers, church and monastery keys, liturgical implements. Other items include household utensils, such as bowls, dishes, pans and cooking bots, while for women there are kohl boxes, necklaces, earrings and bracelets, and there are also medical instruments, weights and measures and agricultural implements. Many of these items are well executed and adorned using different techniques. The majority of these objects are difficult to date, though a few, such as the famous Luxor silver treasure of Abraham, bishop of Hermonthis (c. 600) and some of the Bible caskets, which are inscribed with dates, or objects found with coins, can be securely dated. Egypt lacks good quality wood for the most part, which has always made it a valuable commodity. During the Pharaonic Period find wood, and especially ebony, was imported from the south (Kush, or Nubia and Punt) and cedar from Lebanon and Syria. During the Roman and Byzantine Periods, Egypt was much less prosperous then in much of the Pharaonic Period. Therefore, one might expect that fine imported wood should have been used mainly in Alexandria, but it is known, however, that indigenous wood such as tamarisk, acacia, sycamore, lebbakh, jujube and willow were widely and skillfully used by Coptic carpenters, and that imported woods, such as box, cedar, ebony liquidambar, olive and pine were employed for fine and important works. The main centers of Coptic carpentry were Babylon (a section of Old Coptic Cairo), Antinoe, Bawit and Akhmin. Many churches and monasteries were once adorned with elaborate sculptures in wood, consisting of lintels, doors, panels and friezes, decorated with saints, Nile themes, floral and animal ornaments, geometric patterns and scenes taken from the Old and New Testaments. Smaller items made of wood for daily life include toilette equipment, combs, caskets, toys spindles, stamp seals and musical instruments. Woodwork, particularly screens, doors and panels of the 10th through the 14th centuries, reflects clearly the influence of Islamic Art. The Coptic Museum houses three of the most important wood artifacts from the churches of Old Coptic Cairo. They are the door of the Church of Saint Barbara, the altar of the Church of Saints Sergius and Bacchus and the lintel from Al-Mo'allqa. They are very valuable for the study of Coptic sculpture during the period between the 4th and 6th centuries. Glass has, since its first use in Egypt, been a very important and prosperous industry in Egypt. Unlike wood, sand, lime and soda, the raw materials of glass, were abundantly available in Egypt. In the 1st Century BC, it was discovered that molten glass could be blown through a hollow tube, thus allowing it to be produced in quantities that made it available to the general public. Blown, engraved, opaque and millefiori glass have all been produced by Egyptian glassmakers. Literary sources revel that liturgical vessels in the early Coptic church were most frequently made of glass, rather than gold or silver. The Coptic Museum maintains a small collection containing glass vessels, goblets, pots, candle holders, toilette bottles and lamps, mostly of opaque glass. Pottery is a cheap material and a huge quantity of various wares have been unearthed in Egypt. The study of Coptic pottery in particular has progressed remarkably in the last three decades are so thanks to carefully recorded excavations at many sites. Of particular interest are those of Abu Mina, Kellia, Athribis, Naqlun, Antinoe and Esna. Most are made of brown, red, orange, yellow, cream and pink clay, some coarse and some polished. The Coptic Museum houses a fine collection of pottery made for everyday use, including huge storage jars, amphorae and wine jars, cooking pots, spouted vessels, vases, jugs, bowls and dishes. There are also terracotta ampullae, lamps and figurines. Many of the pieces on display have intricate designs and motifs of which animals are the most common, including hares, doves, fish, lions, gazelles and fantastic animals. Many human figures, mostly in the form of busts, were also painted on pottery, similar to some of those from Bawit. Characteristic of Coptic terracotta are frog-shaped lamps and ampullae depicting Saint Menas standing between two kneeling camels. The Coptic Museum also exhibits some examples of Islamic glazed pottery from Al-Fustat. Almost all Coptic wall painting is monastic. They were never intended to be great works of art, but some of them, and in particular those at Bawit and Saqqara from the 6th and 7th century, show a relatively high standard. These murals were applied to mud-brick walls which had been plastered and white-washed. The only technique used for Coptic murals was tempera. Those paintings from the Monastery of Saint Apollo at Bawit (in the Bahariya Oasis), dating between the 6th and 8th centuries, consist of figural scenes including episodes from the Old Testament, representations of Christ the Pantokrator and the Holy Virgin and Child, often flanked by apostles, figures of monks and saints, medallions depicting the virtues, floral and geometric dadoes, and even hunting scenes. The murals of the Monastery of Saint Jeremias at Saqqara are more or less similar to those of Bawit. The figures are strictly frontal and usually distinctly separated from each other. The presence of Byzantine influence can be seen, but the wall paintings are nevertheless not without originality in some themes as well as in style. Most of the icons in the Coptic Museum were acquired from Cairo's oldest churches. The majority of them are relatively modern, dating from the 18th and 19th centuries. They are, nevertheless, interesting for their themes, including scenes from the Old and New Testaments, the Holy Virgin, saints and martyrs, and especially soldier saints. Coptic churches, both ancient and modern, are always adorned with icons since they are used in the liturgy of the Coptic Church. Indeed, the older churches are perhaps a better venue for seeing the older icons than the Coptic Museum. However, several icons stand out. One, for example, dating to the 18th century, depicts Ahrakas and Oghani, who wear masks in the forms of dog heads. They pear towards a fruit tree. Another depicts the Virgin and Child. He raises a crown with a cross, and is flanked by Saint Peter and Saint Paul. Another touching icon represents the Virgin Mary holding the Christ child, and dates to the eighteenth century. Many others depict various saints. The manuscripts and documents of the museum date from the 4th through the 19th centuries, and are written in Greek, Coptic, Syriac, Old Nubian, Arabic and Ethiopian. Some are even bilingual, written in both Coptic and Arabic. They are printed on Papyrus, parchment, paper, bone and wood tablets, as well as pottery and limestone. Some are complete manuscripts, while others are fragments, mostly biblical, hagiographical and liturgical. Clearly, the documents and ostraca provide valuable insights into the ecclesiastical, social, economic and legal aspects of different periods. Some of the illuminated manuscripts are remarkable. The Coptic Psalter from the 4th or 5th century, recently discovered, is now considered the oldest complete biblical text possessed by Egypt. The Coptic Gnostic codices from the 4th century could be considered one of the most valuable collections of papyri in the world. Coptic textiles are well known and almost certainly the most characteristic product of Coptic art. Coptic textiles is used to describe a huge number of textiles, tens of thousands in fact, found in Egypt and dating from the Roman, Byzantine and Islamic periods. Most Coptic textiles were unearthed from burials, but those excavated during the 19the and early 20th century at such sites as Akhmim and Antinoe were little more than treasure hunts rather than systematic scientific undertakings. There were also illegal digs that saw thousands of Coptic textiles reach the antiquities market, and there are more than a few of these that ended up outside Egypt. It is therefore very difficult to date most of them with precision. In most cases, the style of the textile is all that can be used to date them. Among the various textiles preserved are complete garments, particularly tunics, parts of garments such as tunic ornaments (vertical tapestry bands or clavi, roundels or orbiculae, and panels), curtains and hangings, cushions, covers, napkins and parts of shrouds. The major types of fiber used in making these textiles were linen and wool, although cotton was occasionally used, and even silk, mostly imported, played an important role in the industry. Dyes were usually derived from plant, animal and mineral sources, the principal ones being alkanet (red); woad, indigo, kermes and suntberry (blue); saffron, pomegranate and weld (yellow); leaves of the iris plant, berries of the buckthorn plant (green); and minerals such as iron (black). Purple dye was obtained from shellfish. Coptic textiles are notable for the richness of their decorative motifs, including geometric patterns, human figures, birds, animals, fish, flora, mythological themes, Nile and marine scenes, episodes from the Old and New Testaments and crosses. Hence, Coptic textiles are much more than colorful pieces of cloth. They provide a rich source of information about the social classes, daily life, beliefs and customs of the people who wore and wove them. When the Aswan High Dam was constructed, an international effort was mounted to salvage the Nubian monuments that would be submerged once the construction of the Dam was completed. Included among these monuments were Christian structures dating between the 5th and the 14th or 15th centuries. The Coptic Museum now exhibits a number of frescoes from these churches, including ones from the Church of Abdallah Nirqi (10th century). Other items include Nubian Christian gravestones, pottery and textiles. Old Nubian and Coptic texts from Nubia are also on display. Towards the end of the museum are a few of the most masterful pieces within the museum collection. These include the patriarchal throne build of bronze and copper, resting on four strong columns surmounted by crosses. A second piece is a wooden litter inlaid with bone and mother of pearl used to carry wealthy ladies in Jerusalem. It dates to the Ottoman period and is rich with decorations. The last item is a wooden box with ivory inlays. It was originally intended to store clerical vestments during the 17th through 19th centuries. It is adorned with very remarkable geometric decorations. One may also enjoy the gardens of the museum, which are lush, and there is a cafeteria and a nice gift shop as well. The museum opens from 9 AM until 5 PM daily, and is easily reached by the metro. Science, technology, imagination, truth in the past, present and future; all interact to create a wonderful world for the Egyptian child, namely, the Child Museum. It is an edifice that appeals to a child's intelligence and inquisitive nature, allowing interaction with what he sees in full freedom. Children at this museum are able to deal with high technology and modern methods to enrich their knowledge and imagination. Mrs. Suzanne Mubarak, the patron of Egyptian children, was the first to express the wish to establish a museum for children that ushers them into an attractive world where they are encouraged to observe, get acquainted with and discover everything new and by comparison and touch - try to find for themselves the answers to their questions. The aim of establishing a child museum is to make the child feel his/her absolute importance. and unique museum for the Egyptian child. A child starts his tour of the museum after he receives his "passport". He sees, listens and gets acquainted with all the different aspects of life, starting with the ancient forefathers and progressing up to modern times. He begins to realize the relations between all objects, and the fact that he is a part of everything he observes in nature and in evolution. The museum provides the child with cultural knowledge of Egypt, his motherland, with all its physical, environmental, artistic and scientific characteristics. The main building of the museum is in the center of the park and is made up of four divisions, each of which narrates the story of an epoch or geographical environment. The Pharaonic civilization explains to the child how the Ancient Egyptians dealt with the River Nile, silt, plants, rocks and minerals, and how he made his clothes, food and houses. The various devices of irrigation are displayed, and a child can see each one of them by pressing a button. followed by the French in deciphering the Rosetta Stone inscriptions 200 years ago. Other displays acquaint the child with Ancient Egyptian skills in ship-building. The main building has a hall in which a stone building is exhibited. By a press-button system, a child can see a mechanical movement of the Pyramid by which it is segmented to reveal its inner passages and rooms. The various kinds of stones, methods of cutting and leveling are also viewed on the screen. This hall exhibits three communities: the source of the Nile inhabitants; Nubia region; and the countryside in Upper and Lower Egypt. The video tape plays songs and music characterizing peoples of the Nile. Here a child gets acquainted with Egyptian deserts, their resources, their plants and animals, and how those are adapted to severe hot climates and scarcity of water. and Sinai. The dialogue explains dunes and formations, as well as dangers that might meet a desert visitor. on marine life, urging children to protect the environment. The second floor of the Museum has a full-size statue of Mrs. Suzanne Mubarak holding an open book and addressing the children of Egypt. The message delivered in her voice urges children to read and enrich their knowledge by having a library in every Egyptian home. Children stand in front of "Mama Suzanne" listening to her advice. The statue, which has the library as a background, was presented to Mrs Mubarak from the British Museum for her work as the patron of childhood in Egypt. The British Museum has taken part in and supervised the establishment of the Children’s Museum. The Children’s Museum has an activity center occupying the southern pavilion behind the Museum. The "Discovery Hall" is one section of the Activity Center. It comprises many boxes in which a child discovers contents and tries to identify them as different elements from the environment he has seen in the main building, such as precious stones, fossils and shells. painting on glass and cardboard. Here children can freely practice their hobbies and creative skills. The "Know yourself" division houses skeletons and the internal human body parts, so that a child may get acquainted with them by dismantling and rebuilding them once again. The "Information Hall" comprises a great number of books, video and cassette tapes, pictures, slides, and multimedia CD-ROMs. It helps a young researcher to teach himself all fields of knowledge such as history, geography, anthropology, environment, nature study and science. Periodical meetings are held in this hall where children, parents and teachers meet to exchange views on matters dealing with education development. The park surrounding the Museum is rich in numerous plants and trees carrying labels of information on every species for a child to read and compare as he tours the park. He can then try to draw what he observed with the help of the tour leader. Children are provided with the opportunity to watch the birds in the park picking their food from the ground and compare their beaks, feathers and claws. They can also observe the birds' nests using binoculars. to observe the behavior of ants, bees and other insects. In this way the Child Museum is not merely a building displaying objects, but rather a pioneer experience in Egypt where building, park and child interact and are integrated. A child's freedom to discover, think, innovate and observe is of paramount importance.